I don’t know how long it will be before the Supreme Court rules on the constitutionality of the individual mandate and on so-called Obamacare generally, but there’s no escaping the problems posed by the high numbers of uninsured Americans. Nine of the 10 metro areas where residents were most likely to be uninsured last year were in Texas, California, and Florida — three states with large Hispanic populations. Gallup has consistently found that Hispanics are among the most likely in the U.S. to be uninsured since it started tracking health insurance status in January 2008. The McAllen-Edinburg-Mission metro area has by far the largest Hispanic population in the nation: 90.6% in 2010 according to the U.S. Census Bureau. An average of 49% of residents is Hispanic in the 10 metro areas with the highest uninsured rates, compared with 8.3% in the 10 areas with the lowest rates. Nationwide, 17.1% of Americans lacked health insurance in 2011. To the left you can see the metros with the highest percentage of uninsured residents. Not surprisingly, four Massachusetts metros have the lowest rates (due to an individual mandate enacted under Mitt Romney). Just 4.4% of the Boston-Cambridge-Quincy metro area residents are uninsured. 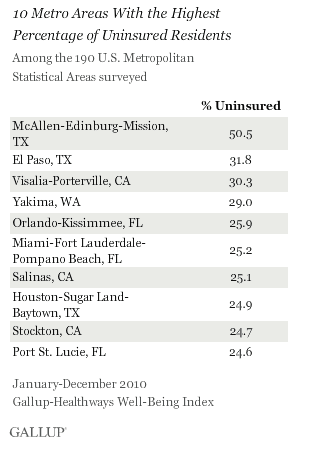 The Savannah metro area has 19.5% uninsured, somewhat worse than the national average of 17.1%. Obviously, if one removed the number of children and seniors from the data, the rate would be considerably higher for working-age adults.